This is the 5th post in a series of posts recapping the courses in my UX Design graduate program at MICA. This program so far has been challenging and rewarding . All the classes have been taught by industry professionals and I’ve learned a lot about particular nuances of UX design processes. I’ve noticed that many of the projects so far have tried to simulate the ‘real world’. In Prototyping, we were given real web analytic data and survey responses from players in a beach volleyball league. In my most recent class, we needed to reach out to and interview real people regarding our project’s topic. Although we’re in an online classroom environment, there are still very real resource constraints. I’m pursuing a Masters in Professional Studies degree at MICA. This is a unique program in that it’s a lesser known type of Master’s degree which is specialized in a certain field. But, a graduate program isn’t the only way to learn UX. The newest program that I’ve seen is Center Centre, that says they are “the user experience design school creating the next generation of industry-ready UX designers”. The goal of this class was to learn about users. From the course description: “a course designed to provide students with real world case-studies that illustrate challenges faced in the UX industry specifically related to end users”. Essentially we needed to gather a lot of data and form them into really good user personas. Then take those and propose a solution that would help those users. I chose to look into towing in Baltimore, specifically Find My Tow. 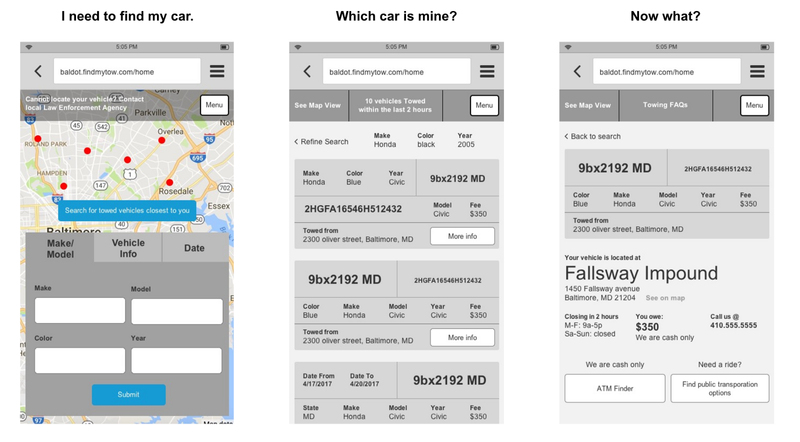 On 3/20/17, the Baltimore DOT released findmytow.com to help drivers find out if their car was towed and what the associated fees are. Towing is of course not unique to Baltimore, but it is a big deal. So much so, that city council members have introduced legislation to rein in the extreme nature of towing in Baltimore. But towing is just an effect of many preceding causes. Baltimore has a rocky relationship with commuting. Although we’ve got many modes of public transportation, they’re all pretty inefficient. The buses are slow that civic hackers have created their own bus tracking app. The subway (yes, Baltimore has a subway) is only one line, along with the light rail. The free bus, the Charm City Circulator, might not be free forever. Ride sharing and bike sharing is here but it’s not a practical commuting solution. Public transportation woes goes way back in Baltimore’s history. James Dilts, a Baltimore Sun contributor, wrote in the 1960s about the decision between investing in expressways and investing in public transportation, and the impact it would have. “Baltimoreans could seriously ponder the question of whether the city is more important to live in, or race through”. With Baltimore’s population dropping to a 100 year low, Baltimore is very much a city that people race through. This leads to drivers, which leads to those drivers parking, which leads to many of those cars getting towed. And all of that leads to Find My Tow. Any search returns a query of the whole database. They even show a pop up telling you it might take a while. Search results are displayed in a 15 column table that extends off screen. Many fields are empty depending on the search parameters. Although it informs you of the cost, drivers need the when, where and how to retrieve the car. Competitive Analysis — There are no typical competitors in this space, but there are similar systems in place in other cities. After looking at places like New York, D.C., Seattle, Denver, Miami, etc., I found out that cities either create their own towing database, contract out like Baltimore did, or have no system in place. User Research Interviews — I went to reddit and nextdoor to find drivers who were towed. They ranged from age, gender, years of driving, and years of living in baltimore, but all had been towed within the last couple of years. I sent a survey that covered their familiarity with public transportation, getting towed, retrieving their car, and made sure to include a text box to allow for any additional details. Screener — Prior to sending out the interviews, I created a screener, which was essentially just a list of characteristics and questions that would point out any drivers who I’d really like to talk to. For example, if a driver was not familiar with any public transportation, out of town, and had a particularly negative experience, I’d really like to hear more about that person’s account. Funnel Matrix — The funnel matrix helped me think about all the stages of getting towed, and the information possessed and needs of the driver at each stage. Finding out you’ve been towed, inputting information, analyzing results, and finding and retrieving their car. Each step needs to be provided with the right information. I broke down the solution into 3 steps. First you need to find your car. Then you need to find your car out of all the results. Finally, you want find out how to retrieve the car. Baltimore is a city that people race through. Connected to I-95 makes it perfect for just that, along with many drivers coming in from the county. You may not be from Baltimore and know exactly where you are in the city so on the home screen, if you ‘allow location access’, you can see recently towed cars nearest to you. Many survey respondents didn’t know their plate # or VIN #. The form to input information is tabbed and grouped into categories with related fields, which limits the mental barrier to perform a search query. Results are displayed in a modular fashion. Cards display different fields depending on the search result. A search for ‘Make, Model, and Year’ will display cards with those fields at the top. Tow lots in baltimore aren’t open on the weekends, are cash only, and may not be close to you. When you have your primary method of transportation taken away from you, and are unfamiliar with public transportation, getting to the tow lot can be challenging. Once you find your car, the next screen shows all of the necessary information needed to retrieve the car. Hours, location, and fee. Also, there are ways to find an ATM and transportation options. Here is a list of my classes. I’ll be covering each class in an article much like this when the class is wrapping up. My next class is called “UX Design Lab 2: Utility”, which is a detailed look into usability, ease of use, and user satisfaction.